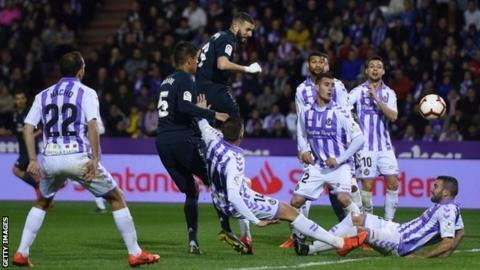 Real Madrid came from behind to beat Real Valladolid in La Liga, but head coach Santiago Solari could not say afterwards if he will keep his job. Valladolid were unfortunate not to be well clear as Ruben Alcaraz missed a penalty and Sergi Guardiola had two goals ruled out before Anuar's opener. Raphael Varane equalised from close range and Karim Benzema then scored twice, from a penalty and a header. Casemiro was sent off for two yellows before Luka Modric added a fourth. Third-placed Real, who have only won two of their past six games, are 12 points behind leaders and champions Barcelona. Solari's side were knocked out of the Champions League, the tournament they had won for three consecutive years, after losing 4-1 at home to Ajax on Tuesday - their fourth consecutive home defeat. Afterwards Solari said he "cannot answer that question" when asked if he thinks he will remain in the job he only took permanently in November. "It is an emotional game and it has been a difficult week. The opponent plays too and gave a lot of energy but my players delivered," the Argentine added. "We scored goals that would have been useful to us in previous games, but at least we scored them today." Madrid were coming up against a team who had only won once in 13 league and cup games. And yet the hosts could have been 4-0 up inside half an hour. Alcaraz blazed a penalty well over the bar after Alvaro Odriozola fouled Guardiola in the box, while Guardiola thought he had given Valladolid the lead when he tapped home Keko's cross but the referee disallowed it for offside after video consultation. And three minutes later the striker, who has never scored a La Liga goal, had a header rightly ruled out for offside. Guardiola, a Real fan who was sacked by Barcelona in 2015 after it emerged he had sent anti-Catalan tweets, at least had a hand in the opening goal as he diverted Keko's cross into Anuar's path to tap home. At that stage things were not looking good for a Real side without the injured Dani Carvajal, Lucas Vazquez, Vinicius Junior, Gareth Bale and suspended captain Sergio Ramos. The visitors could have crumbled but they were level five minutes later - although they needed a slice of luck as Valladolid goalkeeper Jordi Masip flapped at a cross, leaving Varane to tap into an empty net. Madrid started to dominate after half-time and after Oscar Plano brought down Odriozola in the box Benzema sent Masip the wrong way from the spot. The French striker then headed in Toni Kroos' shot to put the visitors in control. They were down to 10 men when Casemiro stood in the way of free-kick taker Plano, earning himself a second booking. Real have received a red card in four of their last six matches, as many as in their previous 86. A Valladolid rally never looked on and Modric scored a late fourth after cutting into the box from Benzema's pass. But Madrid's season is practically over as they are 12 points off top, 10 points clear of fifth place and out of the Copa del Rey, and reports of a Jose Mourinho return to manage the club continue. Match ends, Real Valladolid 1, Real Madrid 4. Second Half ends, Real Valladolid 1, Real Madrid 4. Rubén Alcaraz (Real Valladolid) wins a free kick in the defensive half. Foul by Enes Ünal (Real Valladolid). Attempt missed. Sergi Guardiola (Real Valladolid) header from the centre of the box is close, but misses to the right. Assisted by Antoñito with a cross. Substitution, Real Madrid. Marcelo replaces Sergio Reguilón. Substitution, Real Madrid. Jesús Vallejo replaces Raphael Varane. Attempt missed. Daniele Verde (Real Valladolid) left footed shot from outside the box is high and wide to the left. Assisted by Sergi Guardiola. Attempt blocked. Marco Asensio (Real Madrid) left footed shot from outside the box is blocked. Assisted by Karim Benzema. Substitution, Real Valladolid. Enes Ünal replaces Óscar Plano. Goal! Real Valladolid 1, Real Madrid 4. Luka Modric (Real Madrid) right footed shot from the centre of the box to the bottom right corner. Assisted by Karim Benzema. Attempt missed. Duje Cop (Real Valladolid) header from the centre of the box is close, but misses to the left. Assisted by Nacho. Corner, Real Madrid. Conceded by Joaquín Fernández. Second yellow card to Casemiro (Real Madrid). Foul by Óscar Plano (Real Valladolid). Sergi Guardiola (Real Valladolid) hits the left post with a left footed shot from the right side of the box. Assisted by Daniele Verde with a cross following a corner. Substitution, Real Madrid. Federico Valverde replaces Toni Kroos. Substitution, Real Valladolid. Duje Cop replaces Keko. Attempt blocked. Casemiro (Real Madrid) right footed shot from outside the box is blocked. Assisted by Sergio Reguilón. Offside, Real Valladolid. Daniele Verde tries a through ball, but Sergi Guardiola is caught offside. Foul by Joaquín Fernández (Real Valladolid). Attempt blocked. Daniele Verde (Real Valladolid) left footed shot from outside the box is blocked. Sergi Guardiola (Real Valladolid) wins a free kick in the attacking half.